This is an advertisement for SheSpeaks/St. Martins Press. I just love historic novels, especially ones about British royalty. 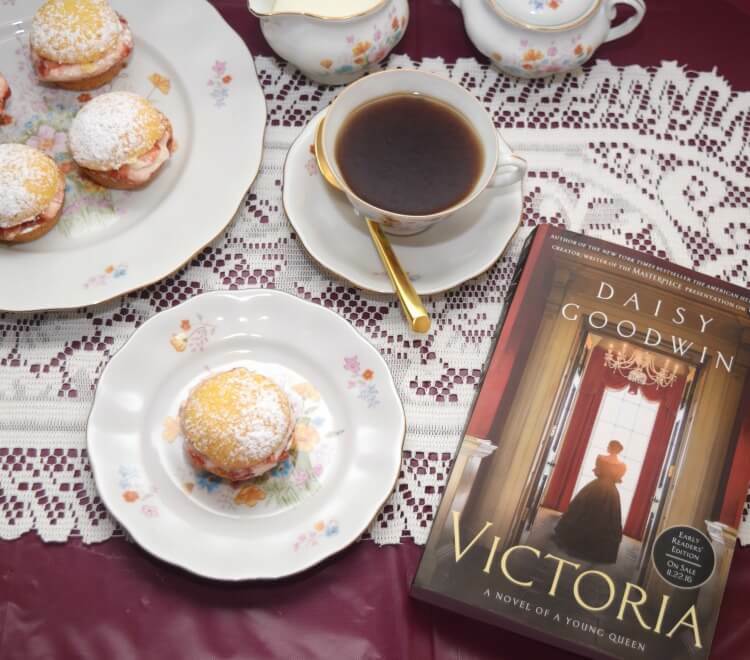 Victoria by Daisy Goodwin is the story of Queen Victoria as a teenager when she first becomes queen leading up to her marriage proposal to Albert. Several years ago I saw the movie The Young Victoria and thought this novel had similar elements. I couldn’t put this one down. I was cheering Victoria on as she got out from under the thumb of her mother and Lord Conroy, who wanted to control her. Her reign could have been very different if she had allowed them to continue to control her. I also did not realize Queen Victoria had quite the school girl crush on Lord Melbourne. I thought he was just her private secretary. Daisy Goodwin said Queen Victoria’s diary inspired her to learn more about her, “I saw me dearest Albert who was all wet in his white cashmere breeches with nothing on underneath.” After reading that, I have to admit I was hoping for something a bit steamier. While an interesting story, this novel was completely tame. It was a little disappointing as I tend to like some juicy romance in the historical fiction I read. After finishing this novel and finding out Daisy Goodwin wrote the PBS Victoria series, I cannot wait to delve into it. If you love historical fiction, especially of the British persuasion, I think you’ll really enjoy this one. It’s inspiring to read how a teenager who’s been cloistered her entire life turns into a queen to rule an entire nation. Reading Victoria made me curious to learn a little more about the Victorian era. Did you know British Afternoon Tea started during her reign? One of her ladies, the Duchess of Bedford, would be hungry before dinner, which sometimes wouldn’t be served until 9:30 at night. So, she would ask for tea and biscuits to be sent up. 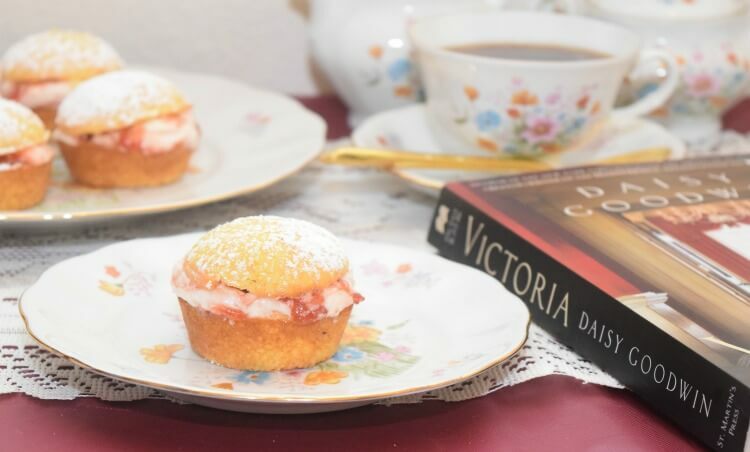 Victoria loved the idea, and soon her favorite was a sponge cake served with buttercream and fresh raspberries with her tea. 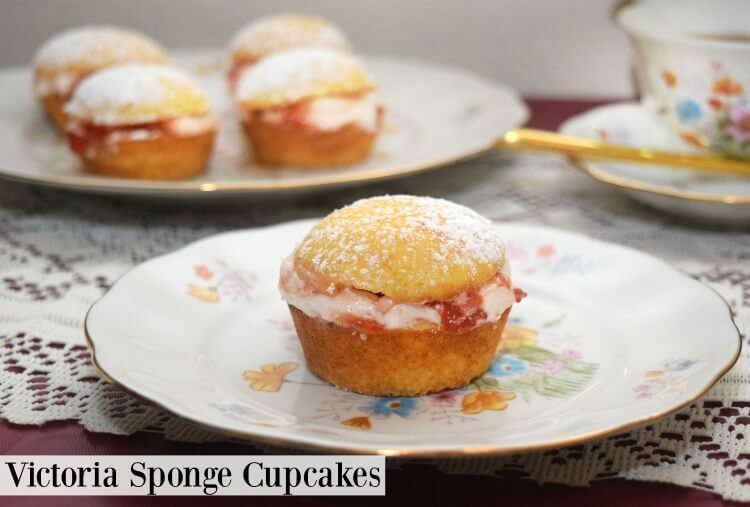 Today, I’m bringing you a mini version of Victoria Sponge Cake. 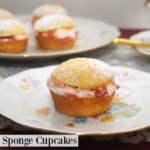 It’s made as cupcakes and stuffed with raspberry jam mixed with buttercream. They’re dusted with powdered sugar to top them off. My secret to make this quick and easy is to use a cake mix. It’s been sifted, and then egg whites have been whipped to stiff peaks. Add the other ingredients according to directions, and then finally, fold in the egg whites. Preheat oven to 350 F degrees. Combine cake mix, oil and water, and mix until combined. Beat egg whites to stiff peaks. Gently fold egg whites into cake batter. Spray a cupcake tin with nonstick spray. Fill each cupcake tin halfway with batter. Allow cupcakes to cool completely. Beat butter and 1 cup of powdered sugar on medium high with an electric mixer. While beating, add 1-2 tablespoons of heavy cream. Add second cup of powdered sugar. Add another 1-2 tablespoons of heavy cream if necessary. Beat for another 1-2 minutes until fluffy. Carefully slice the tops off each cupcake. Gently mix together jam and buttercream and add a tablespoon to the middle of each cupcake. Replace the tops of cupcakes. 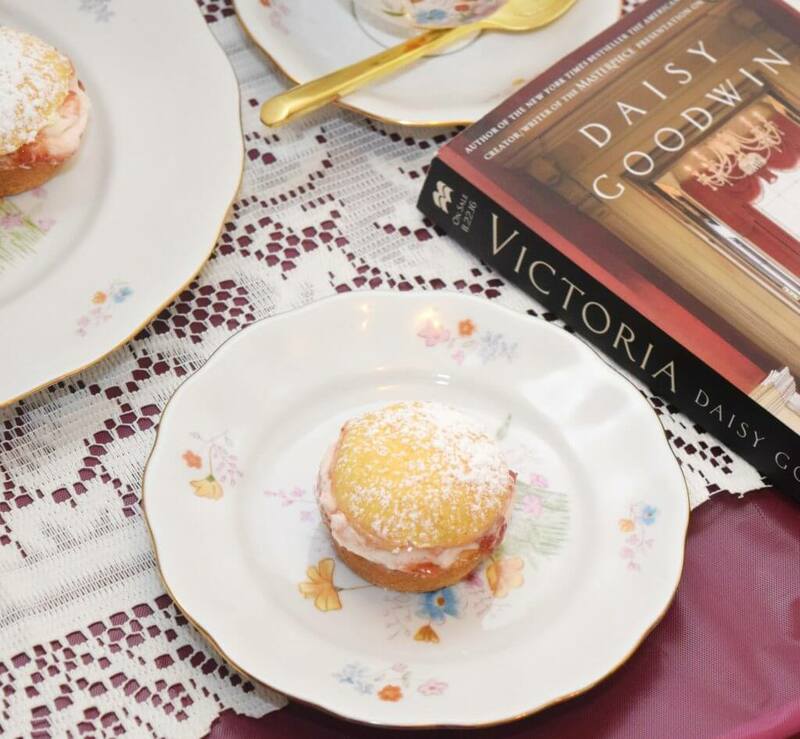 It makes a lovely sponge cake perfect for your Afternoon Tea while relaxing and reading the new Victoria novel by Daisy Goodwin. Victoria comes out November 22, and you can pre-order now! Get your copy on Amazon or Barnes and Noble. You’re just going to love it! For more information about Victoria, please visit DaisyGoodwinNovels.com. I'm a mom of 4. My kids range in from 1 to 19. 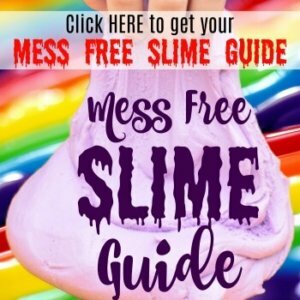 I love sharing shortcuts to easy recipes, crafts, and so much more. Let's make something fun! @2012-2019 - The TipToe Fairy. All Right Reserved.